NFL rosters seem to constantly be in flux, but they especially fluctuate during the first month or so after the NFL draft as rookie mini-camps (e.g. try-outs) are held and rookie contracts are signed. Things typically settle down by the end of May as teams head into “Organized Team Activities” (OTAs) and summer workouts. The next round of cuts now takes place at the end of fall training camp when 90 man rosters are whittled down to 53. Of the 30-40 players that are cut, typically 8-10 players are retained (after clearing waivers) and placed on the practice squad. Historically BYU only has one or two players drafted but will have another 5-10 players get mini-camp invites and/or sign undrafted free agent contracts in the spring. Of those, about half survive the spring cuts. Then about half of those that remain are cut at the conclusion of fall camp. That process typically results in 2-3 new BYU players on active rosters in the NFL each season. The BYU football team had seven players from the Class of 2018 get a shot at the NFL this spring, with another two alumni that had transferred away from the program getting looks. Of those nine players there are currently six on NFL rosters. Fred Warner (LB, San Francisco). Drafted in the 3rd round (no. 70 overall) by the 49ers. Has not yet signed a contract. Micah Hannemann (DB, Cleveland). Signed a three-year contract with the Browns as a free agent after going undrafted. Tejan Koroma (C, Kansas City). Signed a three-year contract with the Chiefs as a free agent after going undrafted. Also attended a rookie mini-camp at Tennessee. Tomasi Laulile (DT, Indianapolis). Signed a three-year contract with the Colts as a free agent after going undrafted. Jonah Trinnaman (WR, New York Jets). Signed a one-year contract with the Jets after being waived by the Arizona Cardinals. Dallin Leavitt (S, Oakland). BYU transfer, USU grad. Signed a three-year contract with the Raiders as a free agent after going undrafted. Tanner Balderee (TE). Attended the Cleveland Brown’s rookie mini-camp but was not offered a contract. Handsome Tanielu (DL). Attended the Kansas City Chief’s rookie mini-camp but was not offered a contract. JonRyheem Peoples (OL). BYU transfer, ISU grad. Attended the New Orleans Saint’s rookie mini-camp but was not offered a contract. The six rookies that are still on NFL rosters join an additional 13 BYU alumni already on teams. Bronson Kaufusi (DE, C/O 2016, Baltimore) battled injuries last season and had just one start with five total tackles. He is in the third year of a four year contract with the Ravens. Kai Nacua (S, C/O 2017, Baltimore) played for the Cleveland Browns last season with three starts and 14 total tackles. It was not enough to stay with the Browns and he was waived in April. He was picked up off waivers by the Baltimore Ravens and Nacua will complete the second year of his two-year contract in Baltimore. De’Ondre Wesley (OT, C/O 2015, Buffalo) spent last season on the Bills practice squad and signed a reserve/future contract with them this spring. Jordan Leslie (WR, C/O 2015, Denver) spent last season with the Cleveland Browns. He had one incredible catch but spent most of the season on the practice squad and then on injured reserve. He was waived by the Browns in December and picked up by Denver in January and signed to a one-year contract. Ziggy Ansah (DE, C/O 2013, Detroit) had an incredible season last year with Detroit recording 44 tackles and 12 sacks. He was rewarded with a huge contract and the franchise tag and is in negotiations for a long-term deal. Colby Pearson (WR, C/O 2017, Green Bay) spent time last season on the Packer’s practice squad and was able to sign a reserve/future contract with them in January. Jamaal Williams (RB, C/O 2017, Green Bay) had a phenomenal rookie season for the Packer’s last year recording 153 carries for 556 yards and four touchdowns as well as 25 receptions for 262 yards and two more scores. He is in the second year of a four-year contract with the Packers. Daniel Sorensen (S, C/O 2014, Kansas City) had his breakout season last year recording 89 tackles, one interception, and 1.5 sacks. He signed a four-year contract extension last spring. Michael Davis (CB, C/O 2017, Los Angeles) spent his rookie year on special teams and recorded 18 tackles and a pass break-up. He is entering the second year of his three-year contract with the Chargers. John Denney (LS, C/O 2005, Miami) is entering his 14th season with the Dolphins as their long snapper. He signed a one year contract in March. Harvey Langi (LB, C/O 2017, New England) was injured in a car accident last season and had to sit out the season. He’s in the second year of his three-year contract with the Patriots. Kyle Van Noy (LB, C/O 2014, New England) has his best season last year recording 73 tackles and 5.5 sacks for the Patriots. His current contract is through 2019. Taysom Hill (QB, C/O 2017, New Orleans) was claimed by New Orleans off waivers by Green Bay last spring. He played on special teams as a rookie and recorded four tackles. He is in the second-year of a three-year contract. Robertson Daniel (DB, C/O 2015) was released by Baltimore in January. He has played for four different teams since joining the league in 2015. Sae Tautu (LB, C/O 2017) was released by New Orleans in May after spending his rookie season on their injured reserve with a sprained MCL. So right now BYU has 19 alumni on NFL rosters with another handful hoping to get added to teams over the summer. What has happened to all the other BYU football alumni that have played professionally in the last couple decades? 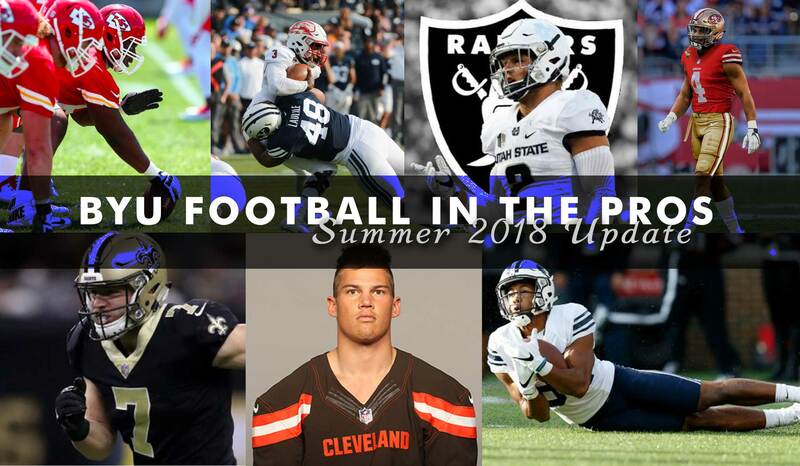 This summer I am updating and completing mini-profiles for every BYU alumni since 2000 that has played in the NFL as part of the Pro Tracker portion of the website (see: http://byuinsider.com/football/after-byu/pro-tracker/). I will be adding 1-3 profiles every day until this section is completed so check back often. I’m also working on a book that includes these same profiles, but expands them to include summaries of their prep and collegiate careers, detailed transactions of their professional careers, what they’re up to now, and some interviews with the players that covers their favorite memories at BYU and in the pros, what they things of BYU football now, etc. I’m talking to a few publishers right now and still am not sure whether to go traditional (print) or independent (ebook) on this project. And while I’m focusing on the Classes of 2000-18 this summer, my hope is to continue to update and expand the book each year summer. So it might make the most sense to put out an ebook and paperback this summer, but in the future go with a publisher to create a coffee table-type book. If you want more information or to be notified when the book is released you can sign up here.